As the first to ship a multi-disk 1TB hard disk drive (HDD) in 2007, Hitachi Global Storage Technologies (Hitachi GST) today announced that is has achieved yet another 1TB milestone by squeezing it on a single disk. Leveraging the company’s strong R&D heritage and time-to-market leadership, the new one terabyte per platter (1TB/platter), one-disk, Hitachi Deskstar 7K1000.D drive family is now shipping worldwide. Featured in both Deskstar and CinemaStar brands, Hitachi is providing a full range of capacities, 250GB – 1TB, on both low RPM CoolSpin and 7,200 RPM platforms. With the addition of the new Deskstar and CinemaStar drives, which are first in a family of 1TB/platter drives, Hitachi continues to offer one of the broadest most reliable product lines for desktop and mobile solutions. For the ultra thin and light notebook market, Hitachi delivers the 7mm z-height Travelstar Z5K500 drives (636 gigabits per square inch “Gb/in²”). And now, ideal for high-performing desktop computers and the consumer electronics (CE) market, Hitachi presents the new 1TB/platter Deskstar and CinemaStar family drives (569 Gb/in²). Hitachi Deskstar 7K1000.D and Deskstar 5K1000.B with Coolspin Technology The Hitachi Deskstar 7K1000.D hard drive family provides the ideal combination of performance, capacity, reliability and value required for today’s power-friendly consumer and commercial desktop computers, as well as external storage solutions, PC gaming systems, and desktop RAID arrays. Built using Hitachi’s proven 7,200 RPM platform, the drive delivers amazing speed with a 6Gb/second Serial ATA interface and a 32MB cache buffer. With eighth-generation power management technology and power-saving HiVERT innovations, this new drive provides up to 15 percent idle power savings over the previous model. Hitachi is also offering the new Deskstar 5K1000.B drive family with low power and cool operation. With CoolSpin technology, along with other Hitachi power management techniques, the Deskstar 5K1000.B delivers a 23 percent idle power savings over the Deskstar 7K1000.D, enabling a new generation of cool and quiet personal computing devices. The low power profile of both the Deskstar 7K1000.D and the Deskstar 5K1000.B drives helps reduce overall system power requirements for developing energy-efficient systems. HD, IPTV and Internet TV growth are driving the demand for cost-effective storage-based TVs and DVRs for consumers to record, playback, surf and stream their favorite movies and shows from their TVs. In the CE space today, approximately 90 percent of HDD demand is for single-disk capacities ranging from 250GB to 500GB, which can be served by Hitachi’s new 1TB/platter CinemaStar family. The new Hitachi CinemaStar 7K1000.D and 5K1000.B product lines give customers a dedicated 3.5-inch family that delivers a balance of performance, power, acoustics and capacities that is optimized for this market. With more than 10 features and technologies optimized for A/V streaming, the new CinemaStar 7K1000.D and 5K1000.B offer a variety of capacity and RPM choices for DVRs, set-top boxes and video surveillance systems. 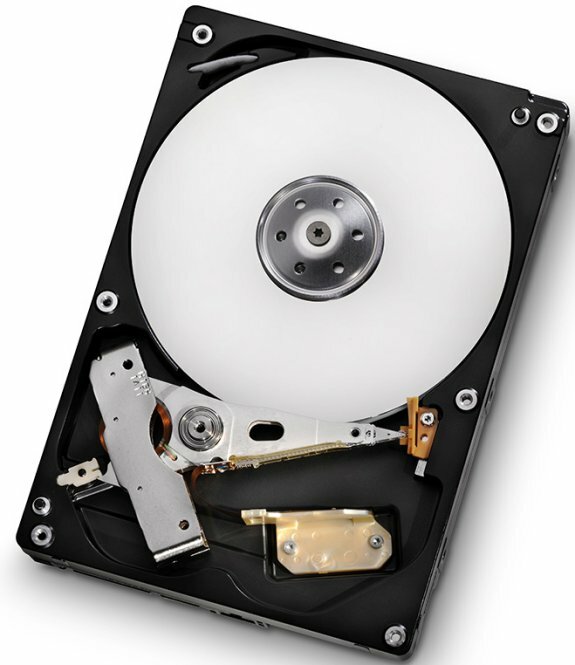 All 1TB/platter 7,200 RPM and Coolspin versions ship with a 32MB cache buffer and a 6Gb/second Serial ATA interface. The Hitachi Deskstar 7K1000.D and 5K1000.B CoolSpin versions are shipping today to distributors and channel partners. CinemaStar drives are expected to ship in the Fall.